SPF clothing stands for “sun protection factor clothing”. They are clothes that are stitched together using tight fabrics in order to block out ultraviolet rays from the sun. An SPF rating is based on how many units of ultraviolet radiation it reflects before one unit can get through. SPF clothing with a rating of 50 means that for every 50 units of ultraviolet radiation that fall on the clothing, only one unit gets through. This is not to be confused with the ultraviolet index, which is a numbering and color coded system that indicates the amount of ultraviolet radiation falling in a given area at a particular time. Do I need SPF clothing? Yes. Due to damage to the ozone layer over the past century, more ultraviolet rays are reaching the Earth than ever before. Besides causing sunburns, it can cause skin cancer since damage to the skin from the sun can be cumulative over one's lifetime. When are ultraviolet rays at their peak of intensity? Ultraviolet radiation reaches its peak when the sun has its highest angle in the sky. Peak months in the northern hemisphere are May, June, July, and August, however we do receive ultraviolet radiation year round. 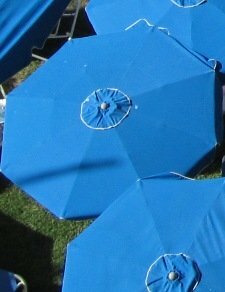 Who is most at risk from ultraviolet radiation? People with light, fair skin get the most damage from UV rays, but they affect everyone. Children and people who have sun sensitivity due to medical reasons are also in the high-risk group. Since the ozone layer is more depleted in the southern hemisphere, people living in that region get more UV rays than those in the northern hemisphere. How does SPF Clothing protect from ultraviolet radiation? Sun Protective Factor clothes are tightly woven, but can still be lightweight for maximum comfort. When the rays of the sun hit the clothes, the radiation is blocked by the fabric. 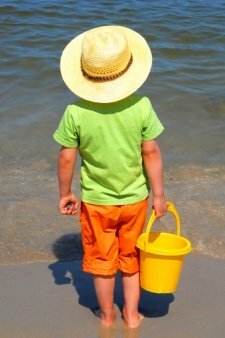 Can I buy sun protective clothing used? If you can find it you can, but be careful. The fibers and weaves of protective clothing can loosen after time, which will decrease the clothes effectiveness. For maximum protection, buy your sun protective clothing new. There are various stores where you can buy them, and there is a large variety of places online that carry various types of clothes that offer sun protection. Most of these stores offer a safe and secure connection for ordering. Always look for a padlock near your address bar before giving out personal information online. Most online stores take a credit card or a paypal account. Aerosol spray cans have greatly depleted the ozone layer over the last 50 years. The damage is not irreversible, but the proper amount of ozone might not be restored for another 50 years. Cases of skin cancer are on the rise worldwide, and it’s a trend that is not going to change if people don’t take the proper precautions. Even if you don’t get skin cancer, the sun can damage the skin over a period of years. SPF Clothing when used with sunscreen on the exposed areas greatly reduces the risk of sunburn and skin cancer.